Atopic dermatitis (AD) also known as atopic eczema or eczema (from Greek ἔκζεμα ekzema "eruption") is a type of dermatitis (from Greek δέρμα derma "skin" and -ῖτις -itis "inflammation"), an inflammatory, relapsing, non-contagious and itchy skin disorder. 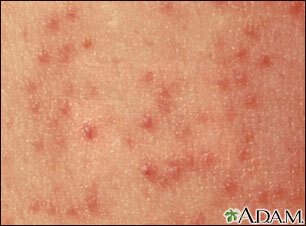 It is characterized by itchy, erythematous, vesicular, weeping, and crusting patches. Atopy is defined as an inherited tendency to produce immunoglobulin E (IgE) antibodies in response to minute amounts of common environmental proteins such as pollen, house dust mites, and food allergens. Atopic dermatitis is a chronic inflammatory skin condition that appears to involve a genetic defect in the proteins supporting the epidermal barrier. Atopic dermatitis affects approximately 5 to 20 percent of children worldwide. The incidence of atopic dermatitis appears to be increasing. It may occur in any race or geographic location, although there appears to be a higher incidence in urban areas and developed countries, especially Western societies. In the vast majority of cases, atopic dermatitis has an onset before age five years. Atopic dermatitis occurs in the first year of live in 60% of cases, and by the age of five years in nearly 85% of cases. It will clear in nearly 40% of patients by adulthood. The prevalence data in children show a slight female to male preponderance (1.3 to 1). Atopic eczema is a common health problem for children and adolescents throughout the world. Symptoms of atopic eczema exhibit wide variations in prevalence both within and between countries inhabited by similar ethnic groups, suggesting that environmental factors may be critical in determining disease expression. Clinical features of atopic dermatitis include skin dryness, erythema, oozing and crusting, and lichenification. Pruritus is a hallmark of the condition and it is responsible for much of the disease burden for patients and their families. Secondary changes in the skin due to chronic rubbing or scratching are frequently present and these lesions are at a heightened risk for bacterial, fungal, or viral colonization. - Atopic dermatitis of infancy (from infancy to two years old): Infants experience eczema is often localized to the face, scalp, and extensor aspects of the arms and legs, but it can also be widespread. The lesions are characterized by erythema, papules, vesicles, excoriations, oozing, and formation of crusts. - Atopic dermatitis of childhood (from 2 years old to 12 years old): In toddlers and older children, the eczema lesions tend to shift location so that they are often confined to the flexures of the elbows and knees as well as the wrists and ankles, although it can occur at any site. In general, the eczema becomes drier and lichenified with excoriations, papules, and nodules. - Atopic dermatitis of adolescence and adulthood (for those older than 12 years old): In adult patients, the lesions frequently localize to the face and neck, head-and-neck dermatitis. A considerable portion of patients, around 30%, develop atopic hand eczema, which may interfere with workplace activities. The appearance of the individual skin lesion in atopic dermatitis does not differ from other eczemas such as contact eczema. In its acute form, eczema is characterised by a lively red infiltrate with oedema, vesicles, oozing, and crusting; lichenification, excoriations, papules, and nodules dominate the subacute and chronic form. - an increased cholinergic response to scratch, so-called white dermographism or skin-writing, resulting in hives at the affected site. - darkened eye surroundings due to postinflammatory hyperpigmentation. 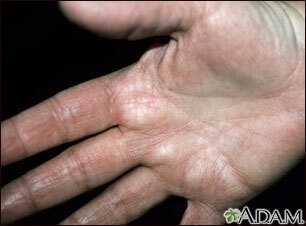 Atopic dermatitis is diagnosed by observing its clinical features. The differential diagnosis of atopic dermatitis includes diseases that sometimes resemble atopic dermatitis such as scabies, seborrheic dermatitis, contact dermatitis and drug reactions. The severity of eczema can be graded according to several scoring systems such as SCORAD and EASI. The theory of immunological imbalance argues that atopic dermatitis results from an imbalance of T cells, particularly T helper cell types 1, 2, 17, and 22 and also regulatory T cells. In the allergic state, particularly in acute eczema ,the Th2 differentiation of naive CD4+ T cells predominates. This causes an increased production of interleukins such as IL-4, IL-5, and IL-13, which then leads to an increased level of IgE, and the Th1 differentiation is correspondingly inhibited. The theory of skin barrier defects is more recent and has its origin in the observation that individuals with mutations in the filaggrin gene are at increased risk of developing atopic dermatitis. The filaggrin gene encodes structural proteins in the stratum corneum and stratum granulosum that help bind the keratinocytes together. This maintains the intact skin barrier and the hydrated stratum corneum. With gene defects, less filaggrin is produced, leading to skin barrier dysfunction and transepidermal water loss, which causes eczema. There is evidence to suggest that the impaired skin barrier, which results in dry skin, leads to increased penetration of allergens into the skin, resulting in allergic sensitization, asthma, and hay fever. Fillagrin is encoded by the FLG gene on the 1q21 epidermal differentiation complex. It is a protein produced by differentiating keratinocytes. Fillagrin loss of function mutation, which causes ichthyosis vulgaris, is also associated with atopic dermatitis. It is an arg501-to-stop (R501X) mutation arising from a 1501C-to-T transition near the start of repeat 1 in exon 3 of the FLG gene or 2282del4 FLG-null allele. Atopic eczema is genetically complex, with multiple alleles at several loci thought to be involved in their pathogenesis. Several susceptibility loci for atopic dermatitis have been identified: ATOD1 on chromosome 3q21, ATOD2 on chromosome 1q21, ATOD3 on chromosome 20p, ATOD4 on chromosome 17q25.3, ATOD5 on chromosome 13q12-q14, ATOD6 on chromosome 5q31-q33, ATOD7 on chromosome 11q13.5, ATOD8 on chromosome 4q22.1, and ATOD9 on chromosome 3p24. Although these two hypotheses are not thought to be mutually exclusive, they may complement each other. The risk of developing atopic dermatitis is much higher in those whose family members are affected. The concordance rate of atopic dermatitis in monozygotic twins is around 75%, meaning that the risk of the disease in the twin sibling is 75% if the cotwin is affected. In contrast, the risk in dizygotic twins is only 30%. This shows that there is not complete concordance between monozygotic twins, who share all their genes, so environmental and developmental factors must play a role too. Many genes have been associated with atopic dermatitis, particularly mutations in the filaggrin gene, positioned on chromosome 1q21.3.The filaggrin gene is the strongest known genetic risk factor for atopic dermatitis. Filaggrin gene mutations give rise to functional impairments in the filaggrin protein and thereby disrupt the skin barrier. The clinical expression of such impairments is dry skin with fissures and a higher risk of eczema. Not all patients with atopic dermatitis have these mutations and other genetic variants have also been incriminated. It is the combined action of all these genetic variants along with environmental and developmental risk factors that cause atopic dermatitis. Many individuals null or heterozygous for filaggrin have atopic dermatitis(eczema) and, in a few cases, also have asthma. Although many different environmental risk factors have been considered potentially causative for atopic dermatitis, only a few are consistently accepted. There is substantial evidence that our western lifestyle leads to some of the reported increase in eczema occurrence over the past years although this has not pointed to specific environmental risk factors or has translated directly into functional preventive measures. There is also the hygiene hypothesis which states that the decrease in early childhood exposure to prototypical infections, such as hepatitis A and tuberculosis, has increased susceptibility to atopic diseases. - Keratoconus and cataracts sometimes complicate atopic dermatitis. Several microorganisms such as bacteria, viruses, and fungi can complicate the eczema (causing superinfections). The skin of the patient with atopic dermatitis is often colonised with Staphylococcus aureus, particularly when the eczema is not well controlled. In normal skin endogenous antimicrobial peptide production is upregulated by two cytokines IL-17 and IL-22, secreted by Th17 T cell. In atopic skin this effect is inhibited by the presence of Th2 cytokines, which causes lower levels of antimicrobial peptides. For this reason it could be created a possible mechanism of staphylococcal superinfection. - molluscum contagiosum, caused by a pox virus, which gives small, umbilicated, dome-shaped, pearly coloured papules. - herpes virus. If such a herpes infection spreads, it can cause eczema herpeticum, which is a widespread vesicular eruption, typically localised to the face, scalp, and upper chest. - woollen clothing, which aggravates itching and discomfort. - several infections, notably staphylococci, are frequent causes of exacerbations. - various foods are, particularly in cases where a patient is sensitized to the food. Food avoidance should be advocated only if a patient has documented allergy to a suspected food and not on the basis of asymptomatic sensitization alone. - stressful living aggravates the eczema. - reduce the duration and degree of the flare, if flare occurs: treatment. Prevention is best attained by trying to reduce the dryness of the skin, primarily via daily use of skin moisturizing creams or emollients along with avoidance of specific and unspecific irritants such as allergens and noncotton clothing. When dryness is reduced, the desire to scratch will lessen and the risk of skin infection will decrease. Management of an eczema exacerbation requires medical treatment often in the form of corticosteroid creams. In addition to topical treatment, severe acute or chronic eczema often requires systemic immunosuppressant drugs or phototherapy (ultraviolet, UV light). - Emollients: they should be applied several times a day and a systematic use has been shown to reduce the need for corticosteroid creams. The main reason for intensive use of an emollient is its ability to increase the hydration of the epidermis, mainly by reducing the evaporation, as it acts as an occlusive layer on the top of the skin. It is generally recommended that a thick (with a high fat content) cream or ointment is used for the driest skin, whereas creams and lotions with a higher water content are used only for very mild eczema. - Topical corticosteroids: are the mainstay of the treatment for moderate to severe atopic dermatitis, both in children and adults. Corticosteroids are hierarchically grouped into different classes based on their vasoconstrictory abilities. For ease, four classes are considered: mild, moderate, strong, and very strong preparations. Mild and moderate corticosteroid creams are reserved for children, while adults can be treated with stronger preparations. - Calcineurin inhibitors: Pimecrolimus cream and tacrolimus ointment. Pimecrolimus has the potency of a mild corticosteroid cream, whereas tacrolimus corresponds to a moderate to strong topical corticosteroid. - Phototherapy: Broadband UVA light and a combination of UVA light and the photosensitizing drug psoralene can also be used to treat severe recalcitrant eczema. Difficult-to-treat atopic dermatitis often clears with 1-2 months' phototherapy three to five times a week, preferably combined with topical corticosteroids. Nevertheless, as phototherapy causes premature aging of the skin and increases the risk of skin cancer in the long run, it should be prescribed with caution. - Specific immunotherapy in patients with atopic dermatitis mainly has an effect on upper airway symptoms if the patient has concomitant allergic rhinitis, whereas the effect on the activity of the eczema is negligible. Oral antihistamines are recommended for itching but have no effect on the activity of the eczema. Nonsedating antihistamines should be used, but when night-time itching interferes with sleep, sedating antihistamines are recommended.